Stars And Garters: Friday Night Fights: Wildcat - Round 4: Bowled Over! Friday Night Fights: Wildcat - Round 4: Bowled Over! A few weeks ago I purchased the Daredevil: Born Again trade by Frank Miller (who also gave us 300) and David Mazzuchelli for a steal on Comixology. This trade had a lot of great fights in it. For tonight's round of Friday Night Fights: Wildcat, I'm featuring one that should be right up your alley and hook you immediately. Synopsis: After learning Daredevil's secret identity through information provided by a heroin-addicted (she eventually goes cold turkey in this story) Karen Page (who at one time was DD's answer to Lois Lane), the Kingpin uses this information to strike back with an elaborate frame-up of Matt Murdock which manages to pin corruption charges on him. Disbarred with his assets frozen by the IRS, Matt's life goes quickly into the gutter. 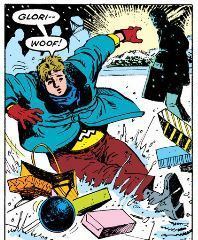 Meanwhile, Matt's best friend and law partner Foggy Nelson is Christmas shopping with Matt's ex-girlfriend Gloriana O'Breen when they run into some foul play. ....but Glori balks at that idea. Uh-oh. Foggy will have to work fast to spare Glori's life. 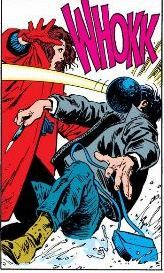 But that's just how Foggy Nelson rolls! 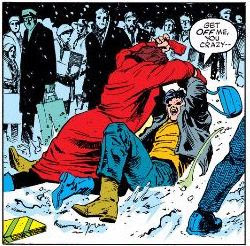 That's one purse-snatcher who's going to need his jaw reset. Tonight's fight music is this bowling-themed bonanza by Camper Van Beethoven. For more finger-gripping fracases, click here. And don't forget to vote!